Last week at the Electronic Entertainment Expo (or “E3” if you’re in a hurry) the two big stories for console makers were 3D1 and new motion controllers. As I watched Sony’s press conference where they pitched the Playstation Move2 something struck me about the way that they presented the pricing for the product. Those adept at the maths quickly figured out that if you wanted to buy all four things –the Move, the navigation controller, the game, and the Eye camera– you’d be out about $130 give or take a penny or two even with the bundles. I myself quickly started thinking through Sony’s announcement from a psychology angle, and my first thought was that they had screwed up. I wrote last week about how our preference for all-you-can-eat/play pricing is rooted in the fact that we experience diminishing sensitivity to increases in losses as they go up –we experience a bigger jump in aversion between a loss of $5 and a loss of $10 than we experience between losses of $1,005 and $1,010. 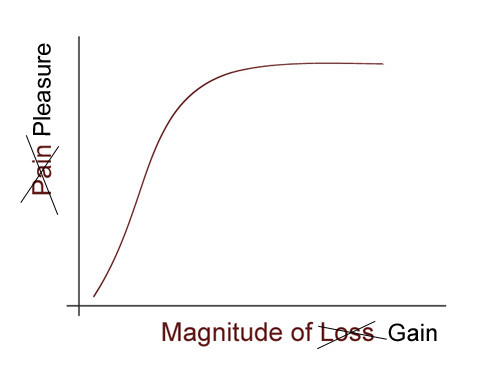 The thing is, prospect theory3 holds that we have similarly diminishing sensitivity to gains. Look at the graph! Figure 1: Diminishing Sensitivity to Gains. Uh, sorry about recycling an earlier graph, but I kind of ran out of time. That’s just how our emotional brains work. And it hasn’t gone unnoticed by advertisers and marketers, who have followed its lead to create what I call the famous “But wait! There’s more!” style of pitching your wares. Just look at any late night infomercial for an example. “Order now and you not only get the juicer for $99.99, but you get the a chopper attachment, a recipe book, five pounds of mangoes, and this adorable kitten –all for free!” True masters of this pitch will stretch out the “free” bonus gifts, parceling them out like a trail of candy so that you perceive them as a series of separate additions to the offer instead of one big bundle. This is a more effective sales technique than just saying “You get all this stuff for $99.99” because it side steps that diminishing sensitivity to gains. This is, in fact, the boat I thought Sony was missing with the way they did their Move price announcement. It seemed to me that it would have made more sense to come out at a price of $129.99 for the Move, but then systematically and not too quickly note that for that price in addition to the Move controller they’re also going to throw in a navigation controller –valued at $29.99! And a Playstation Eye accessory that currently goes for $39.99! Does that sound like a good deal? But wait! What if we threw in a free game valued at $59.99? OMFG! Dude! All for $129.99? That’s CRAZY! That’s like getting the Move controller FOR FREE! But wait! Buy now and we'll throw in 1 + 1 + 1 + 1 Move controllers for the price of 4! What a deal! I got to thinking, though, and eventually came to the conclusion that Sony probably beat me to: despite the power of what I describe above, the way they did it was probably smarter but because of a different psychological phenomenon: anchoring. You may remember anchoring as our tendency to give undue weight to the first figure4 we hear when determining the value of something, even if the number is completely unrelated. As I mentioned in my article about the efficacy of those Steam bundle sales, behavioral economist Dan Ariely and his colleagues did a nifty experiment5 where they effected auction prices just by having bidders write the last two digits of their social security number on the top of their bid sheets. Those with high numbers (like 85) bid way more on items than those with low numbers (like 18). Anchoring! Sony’s presenter capitalized on anchoring, quite deliberately I bet, when he threw up the $49.99 price for just the Move controller. There will be plenty of chances for Sony to advertise the value of bundles using diminishing sensitivity and the “But wait! There’s more!” tropes. Its job at E3 was to come out ahead of Microsoft in terms of how expensive people see its motion controller as when THAT was an important question on everyone’s mind. By throwing out the $49.99 number instead of the $129.99 number, Sony accomplished that. Sure, anybody can do the math, and judging by the audible groans from the audience plenty of people did. But that’s not the point. The point is that you6 are going to anchor on the lower number and think of the Move as relatively cheap. And just imagine how much more effective that $49.99 anchor would have been if Microsoft really had announced the $149.99 price everyone expected for its motion controller, Kinect. I bet some folks at Sony were pretty annoyed that things didn’t break that way. 3. Kahneman, D. & Tversky, A. (1979). Prospect Theory: An Analysis of Decision under Risk. Econometrica, 263-291. ← APB: All Points Bulletin or Aggregated Payment Bias? Both. I think Sony’s decision was pretty smart. I have to admit that I’m a victim of anchoring, since I keep thinking “I may have to pay 50+30 to get the whole experience (I already have the Eye camera anyway), but I know the second glowing stick that will be needed to play with friends is cheaper than that”. Sony knows that people will want to get more of the separate controllers, because it seems you will be needing one move controller in each hand for some games. The camera is already sold separately, so they are giving the customers choices to enter the whole motion control business according to their needs. But coming out with the 50$ price tag first really made it look “cheaper than a game”. I like your article. There are many deceptive practices in the business world and it’s important to expose them. Most people brush this off as obvious but they get caught in various schemes. The scheme taken by Sony is complex and it requires to be able to sit down and calculate. Most people buy using their emotions rather than their rational thinking. Here is another deceptive practice I wrote about on my blog: Two Scoops of raisins. Yeah, the whole “you need an extra controller” is a fuzzy area with a lot of angles. I’m steering clear of that. Thanks! I’m not sure I would go as far as calling this a “deceptive business practice” though. Sony didn’t lie, nor did they omit any information. They didn’t, in a word, deceive. They just made a choice about how to present their product in a way that best suited their goals. That’s marketing. In all honesty, I own a full rig of Wii controllers, so I knew this was coming. Concidering I have a PS3 though, it’s probably less expensive to get a full set of Move/Nav controllers with an Eye than it is to get the new XBox 360 and Kinect. Also, your first link in the third-to-last paragraph (“You may remember anchoring as our tendency […]”} is broken. There are various degrees of deception, from harmless to harmful. A person looks grim and you ask “How are you today?” and this person answers “Everything is fine.” This is most likely deceptive for the lack of commitment + negative emotion registered on his or her face. However, it is harmless. This person may not want to talk about what’s going on or may not want to talk about it with you. I am not telling you that people at Sony are crooks. The price point of their new products is relatively high but close to their competitors for similar products. They had plenty of time to see people’s objections on competing products. 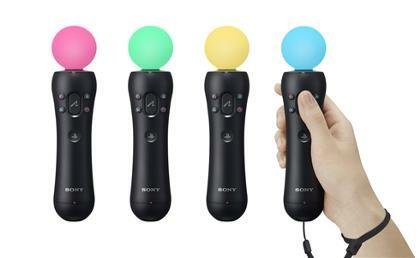 Peter Dille has reduced the resistance people may have to buy when he announced Playstation Move for $49.99. It requires some thinking to know the TCO (Total Cost of Ownership) of this product. By the time a person realize how much it really costs, some of the resistance has been cut off and a rationalization process has taken place. In my opinion, it is deceptive because they know their products cost approximately the same as their competitors and they willingly approached this problem by decomposing the price to appear offering an additional value rather than offering an actual one. “That’s marketing”, “It’s just business”, etc. are a great way to brush off our and companies’ responsibilities. Marketing does not have to hack our brains to be effective. Completely off-topic but i really think these motion controls, video cams and extra controllers are just distracting from the real gameplay. I am kind of sad to see xBox jump on the bandwagon but i guess it makes business sense. Next thing you know the xBox will be piled high with crappy shovelware games that are aimed at kids, moms and grandparents. I enjoyed games much more when they were aimed at a nerds and when playing video games weren’t considered cool. I don’t know, personally, if I pay $19 on something, then later in the day spend $18, and then later I spend $24, it doesn’t feel as bad as it would if you told me all the money I spent that day adds up to $61. Doesn’t it? Is that exactly what marketing is? You need a way to differentiate, in my mind, between your product and the product of your competition. Very often, in a mature market there is no tangible difference in the products; both you and your competitors know exactly what I want, and you are both providing it. Yet you need me to think differently about them if you are to secure the sale. I think I agree. However, now imagine that you spent those amounts on the exact same thing. Wouldn’t you rather have paid just once and been done with it? I wonder if in this context that kind of pitch (“but wait, there’s more!”) wouldn’t be less effective rather than more effective. I think that the population of E3 attendees is savvy enough to see a pitch like that for what it is. It would be perceived as cheesy, low-rent, infomercial style nonsense. This would probably garner more negative press than the way they opted to present it did. I think you’re overestimating how many people like you there are at E3 in general and the Sony press conference in general. A lot of people from the mainstream press and buyers were there. And they needn’t have gone all late night infomercial with it in tone.